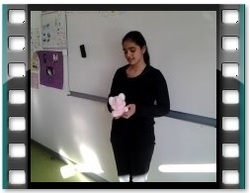 Yasmine talked about a teddy bear she won at a bingo party organised by her Italian teacher. A lovely baby elephant, indeed! this is my baby too !! !